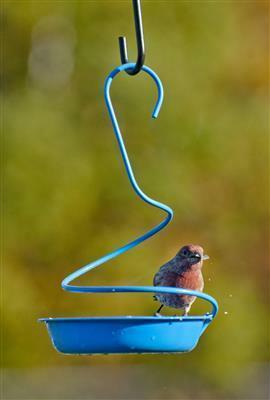 Help Mama and Baby Birds with Mealworms and Get This Feeder FREE!! Groovy, Squirmy and Wiggly??? Indeed! But, if you've never tried Mealworms as an alternative food source for birds, now is the perfect time! Buy a cup of 500 Mealworms and get this mealworm feeder FREE! That's a $12.99 value! Mealworms mimic wild insect larvae and are high in protein and fat. By offering Mealworms at this time of year, you can help Mama birds produce healthy eggs and once their little babies have hatched, provide a highly nutritious food to help their nestlings grow. Plus, you can attract all kinds of birds, such as Wrens, Chickadees, Song Sparrow, Juncos, Spotted Towhees, Robins, Thrushes, Woodpeckers and occasionally, certain warblers to your yard. Don't like the squirmy, live kind? The birds like the live ones the best but if you don't, we have dried ones also! Daily Savings Club Means Savings! Get 15% off everyday on Bird Food!